Well the last week has been quite strange. Weather wise people are saying they don’t remember anything like it. It was enough to keep me off work for two days while the university was shut. Transport has been difficult in the Manchester area and for me it’s highlighted a few things. So Manchester’s quite a big place, if you look at the number of local papers alone, lots of people are here and lots travel using the various methods of public transport. What surprised me was the lack of integration with technology. I won’t go into the intricacies of the city’s integrated transport woes, suffice to say that it was all run by one authority and then it got privatised and is a bit of a mess. Now i’m not a regular user of the system, it has always worked fine for me but I think we as a city look at London’s amazingly oiled machine TfL and wonder why we can’t have that as well? Why should we have to resort to using something line the Manchester Evening News’ crowdsourced traffic news (which it has to be said, has been amazing – incredibly useful)? Why don’t the transport operators update quicker? We want whatever information you can get your hands on as fast as possible. It’s no good for the commuter waiting out a remote bus stop in sub zero temperatures if they have to wait for 30 minutes on your website to hear that their service has been suspended. Yes I understand there are many services but you shouldn’t be running more than you can handle, the detail about the why’s can come later. 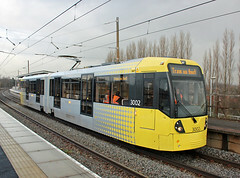 A case in point has been the Metrolink. I like many people have about a 20 minute walk to a stop, now if the service is suspended like in the past week it can be over an hour before it is resumed. I would quite like to know what is going on before I leave the house. I think they’ve got better at it since people have complained about them on the MEN’s Travel news. But even so, many of the official sources such as Manchester Airport on there are employing twitter feeds and proper information pages, so why can’t the Metrolink do the same? So with their now more regularly updated status page I’m doing some screen scraping and having a twitter client periodically update during rush hours to inform people when Metrolink have updated their page. Not that they’d provide something like a useful RSS feed themselves. It’s likely to be highly unreliable and nowhere near as good as GMPTE could build themselves in a few minutes if they bothered. But it’s better than nothing I think. Bought one of these while dithering about buying broadband, o2 had an offer on and it works out cheap enough. It turned out to be quite handy really – quick enough and the ability to get your laptop on the internet without wifi anywhere it’s pretty handy so we bought it for future times when away and want to look up things (settle IMDB arguments, etc). However, don’t let your cat stand on it – they’re not made very well and the connector got broken. Went to the o2 shop and they were a bit narky about it and ummed and arrred but where clearly not going to do anything about it, which we kind of expected. All they could do is point at it and tell us it must be broken (um we knew that? That’s why we came in?). But having paid for a months internet I saw no choice but to get a new dongle and stick the old SIM in it. Oh well. Another lesson learnt. I’d been putting it off a while, not entirely sure why but during the holidays I tend to try and stay away from the internet. I can’t quite manage it any more, especially with the iPhone but I find it worthwhile to try and get my head in the real world for a bit. So i’ve been putting off getting ‘full broadband’ since we moved house, partly also because I hadn’t changed my address with the bank but having done that and having no more excuses with christmas being in the way I ordered it. I’d done my research before we moved, as you may have read in this blog – I’d decided to go with o2, not only because of the nice discount for mobile customers but also because their network was mainly built by Be Internet, who a few years ago had an excellent reputation but were sadly slightly expensive. Now here’s the impressive bit. I ordered it online (using a 3G dongle – another story) on the 29th December. They said that we’d have had the router delivered by the 4th and it’d be activated by the 6th and I was happy with that what with new years eve and all. But by the time we came home on New Years day, the router had already been delivered and when I hooked it up on the second – boom – we were online. Proper Internet, how I’d missed thee. I will rate every single film I see this year and try to rate one’s I have seen also.